History & Overview of Solarscope Filter Designs, and Function. 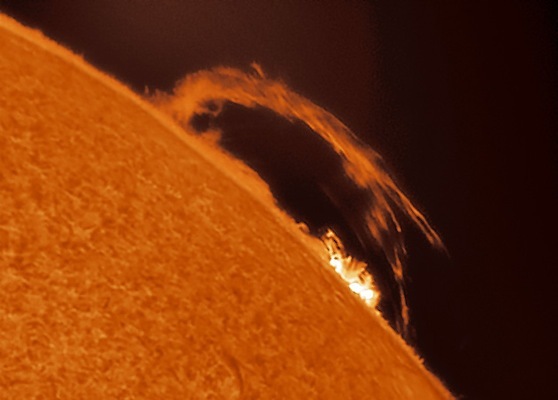 History: Solarscope is a familiar name to the more demanding serious amateur and professional observers of the Sun since 2002 when Solarscope Ltd. was established by Ken Huggett on the Isle of Mann, United Kingdom. Production is based at their Technical Optics Factory, a facility which was originally purpose built in 1977 to manufacture quality high energy laser optics and Fabry-Perot etalon optical substrates; it is these etalon components that since 2002 are the heart of Solarscope Hydrogen Alpha systems. Solarscope has developed a series of specialized Hydrogen Alpha filters for visual observing also well suited for imaging applications. 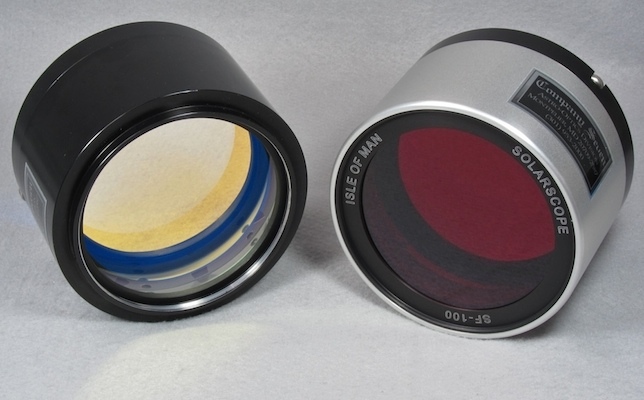 These Hydrogen Alpha filters have been engineered to provide professional performance and consistency even in changing climates, while remaining affordable for those organizations involved with education and research as well as for the most demanding amateurs who seek a rewarding solar observing experience. Overview: The Solarview Ltd. SF/DSF series of tuneable Fabry-Perot etalon based filters have become known among the more astute in our astronomy community as the 'Rolls-Royce' and 'Ferrari' of this class of hydrogen-alpha (Hå) solar filters, featuring first rate craftsmanship and no cost cutting compromises in materials or design. The Solarscope series products have been developed to satisfy those who prefer to carry or travel with a smaller solar telescope, even if paying a premium for it, but that can equal or outperform much larger diameter solar filters of lesser quality. 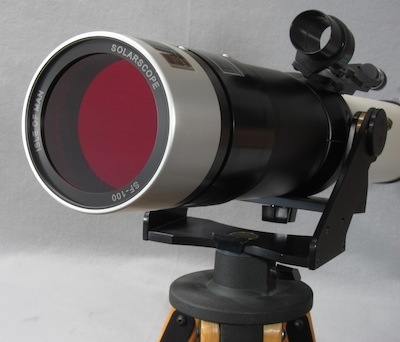 Sure, Company Seven sells competing solar telescopes and filters some that cost one-third the cost of a similar aperture Solarscope, but no similar arranged filter can deliver the fidelity of the views seen or images captured by the Solarscope. Especially when observing under adverse climactic conditions, you will appreciate the thermal stability of these filters. Clientele who select our Solarscope Ltd. products seek to be mightily impressed, but yet do not wish to work too hard while doing so. And those who choose to buy from Company Seven, are the most demanding of the Solarscope clientele in the Americas. "Laser optics and Fabry-Perot etalon filter based instrumentation have been manufactured at the Technical Optics factory since 1977. The Isle of Man has gained worldwide recognition as a centre of excellence for Laser optics and for the manufacture of high quality planar fixed air space, solid and tuneable Fabry-Perot etalon instrumentation. The optical and mechanical components are produced by very highly skilled opticians and engineers, many with decades experience in development and production of optics and Fabry-Perot etalon instrumentation. Etalon manufacture places extreme demands on a company's optical and coating abilities. Material purity, optical figure, plate parallelism, surface, spacer and coating quality are all critical to the overall performance of an etalon. The very high tolerances of surface figure and transmission measurements require use of non contact interferometry with specialised analysis software. Incident light will only be transmitted at a required wavelength through an etalon when the parallel air space between the partially reflective coatings is exactly equal to whole number multiples of half the wavelength of the incident light. In telescopic astronomy, optical filters are often useful for observing objects at specific wavelengths. A major advantage of using etalons as optical filters is their very high throughput at peak resonance and very narrow spectral transmission. Compared with other filters, Fabry-Perot etalons are powerful devices. Their characteristics open up a wide range of applications for spectral analysis where high stability and performance are required for industrial and scientific research, high resolution spectroscopy, astronomy, aerospace and communications. The basis of the Solarscope etalon is a matched pair of ultra fine pitch polished, accurately figured λ/100 fused silica plates, with partially reflective, low absorption coatings for 656.28nm on the front faces and anti-reflector coatings on the back faces. The etalon assembly has optically contacted spacer pieces of very precise thickness, uniformly arranged around the etalon plate periphery to provide maximum rigidity and stability for the air gap. The etalon spacers are cut from low thermal expansion material, polished and figured to high levels of surface flatness and parallelism. When the etalon construction and optical contacting procedure is complete, the tuned etalon assembly is resiliently mounted into a cell designed to afford shock protection and freedom from stress. Solarscope dedicated solar telescope and filter systems feature the only conventional ultra narrow bandwidth Fabry-Perot etalon available to the astronomy community with a full and completely unobstructed aperture. This distinct feature contributes to an image with the highest possible contrast, resolution and definition for both visual and photographic purposes." The Solarscope etalon and full aperture solar filter is only made possible by using the very high optical fabrication skills, time, patience and great care that is normally associated with the manufacture of high quality Fabry-Perot etalons. Products: Solarscope is best known for providing 0.7Å (Ångstrom) SF, and DSF series double stack filter units that narrow the band to 0.5Å. These filters transmit a single sub-angstrom bandwidth line from our Sun centered at 656.28 nm while rejecting the complete background radiation. In addition to offering filter systems that are made to be employed with compatible third-party telescopes such as our Astro-Physics and TeleVue premium apochromatic refracting telescopes, Solarscope developed their own complete portable Hå solar solutions with the "Solarview" or SV series consisting of the 50mm and 60mm aperture Hydrogen Alpha filtered f/8 telescope optical tube assemblies. These filters are not inexpensive, and they can be surprisingly heavy components to put onto a small telescope. So Company Seven recommends using the SF/DSF filters only with suitable telescopes, ones with precision machined front cells and threads to accept the filter directly or with optional threaded adapter. For examples: Company Seven recommends using the SF-70/DSF-70 filter with either a TeleVue 76 or 85 telescope with an adapter plate. We recommend using the SF-100/DSF-100 filter with either a TeleVue NP-101 or 102 telescope since the DSF-100 filter can be threaded directly onto these telescopes and with no need for adapter plate. Our most desired and versatile systems are based on the DSF-100 and DSF-70, double-stack filters that can be employed at either 0.7Å or the forward two elements combined with a matched 30mm Blocking Component at the rear of the telescope to transmit a narrower 0.5Å bandpass. Below we show a DSF-100 processed through our acceptance lab. Note the 0.7Å forward most filter housing is in natural aluminum and will have a red forward (to the Sun) facing element; this matched to the all black 30mm Blocking component below. While at right is the black anodized 0.5Å filter housing, incorporating gold translucent elements, with the matched Blocker distinguished by its blue band. 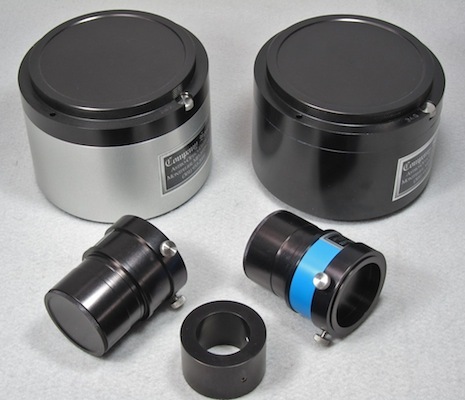 Since the system can accept up to 2 inch accessories, at the center front is a provided 2 to 1-¼ inch diameter reducer. The case in which the set is provided is not shown; this is a simple foam lined plastic case however, Company Seven can provide a custom and ATA shipping-approved custom case. Bigger Is Better - Usually: the comparative light gathering power of systems of similar quality, their ability to show images in terms of how bright they may appear, is better for a larger diameter lens that a smaller lens. The resolving power, or the capacity to reveal finer and finer details, is dependent on 1. quality of the lens - how well and uniformly the system transmits light without noticeably taking away from the image sharpness and without introducing distortion or other problems, and 2. overall lens diameter, and 3. 'seeing' conditions of steadiness and transparency in the atmosphere. 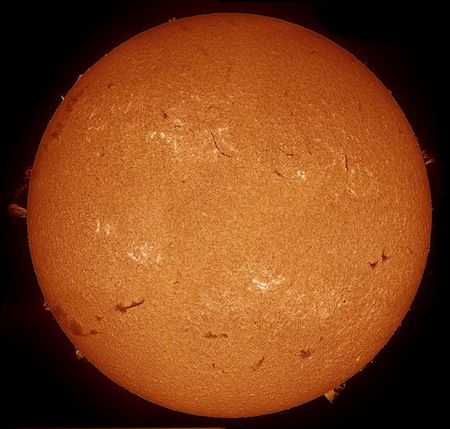 Each of the Solarscope hydrogen-alpha filters can provide views of the Sun that will simply stun the public with their clarity and at times showing a three-dimensional appearance of structures and details on the Sun. The larger diameter the filter however, then not only will more details be seen on the better days but owing their increased brightness the faster exposure times will be practical thus helping to freeze moments of seeing; you will be more likely to acquire similarly stunning photos of the solar activities. Right: Graphic by Company Seven demonstrating differences between circles of 50, 60, 70 and 100 mm diameter (17,153 bytes). When considering the differences in area between the Solarscope filters we can see how the area of a 50mm diameter filter is 1964 sq. mm, while that of a 60mm diameter filter is 2827 sq. mm, or 1.4 x that of the 50mm. The area of a 70mm diameter filter is 3849 sq. mm, or 1.4 x that of the 60mm model. That of the 100mm is 7854 sq mm, or 2.0 x that of the 70mm model. The resolving power differences of each should be proportional to their diameter (aperture), so the 60mm model will provide an increase in detail by a factor of 1.2x, the 70 will provide 1.4x increase over the 50 and 1.2x that over the 60. While the 100mm filter should show twice the details of a 50mm filter, 1.7x that of the 60, and 1.4x the details possible with the 70mm model. Of course this reasoning is logical only when comparing Fords against Fords, or Ferraris against Ferraris. So you can appreciate why some of our customers will opt for the largest apertures they can manage; and those who have the resources to buy the best would opt for a superb 60mm filter even over a lesser 90mm filter. Note at left are 0.7Å and right are 0.5Å components (52,075 bytes). 0.7 and 0.5 filter units (93754 bytes). "it's like someone took off the sunglasses!" 1. The lead time for the fabrication and acceptance testing of a new Solarscope Hydrogen Alpha filter averages between four to six months, maybe a bit less depending on the model desired. Company Seven does have some filter models in stock at times, but we suggest our customers not buy what we have unless it is specifically that model which they want. 2. In addition to being able to study the Sun on any clear day there are special events occurring every year somewhere on Earth including Solar Eclipses, Venus Transit, etc. As we approach another Solar Eclipse the demand for these filters does accelerate. We urge those who need filters for an event to place their orders eight to twelve months or more in advance for the more complicated models, or six to eight months in advance for broader bandpass or simpler configurations. 3. 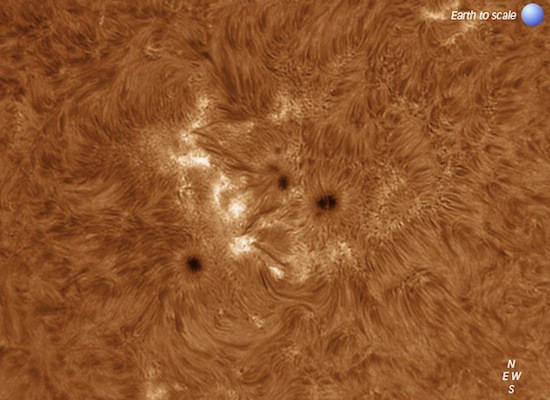 Among the advantages of the Solarscope system is that its design permits use of the Hydrogen-Alpha filter system with many differing apertures telescopes or lenses. This means one can operate the Solarscope filter on one telescope one day then travel with just the filter to another location and attach the filter onto another telescope; of course a proper thread adapter may be required and Company Seven can provide that. 4. In addition to the cost of the Solarscope Hydrogen Alpha systems require no electrical power; for nominal performance they rely on a component tilting mechanism. Once properly tuned, the design is practically speaking impervious to the effects of ambient temperature changes. Click on image to see enlarged view (138,582 byes). Company Seven: is among the most long-lived and experienced distributors of the Hydrogen Alpha filter systems in the world. We are one of only a couple experienced sources showing and selling the filters manufactured by DayStar, by Lunt, and of course by Solarscope from the Isle of Mann. We serve an international clientele but have also established our own "Solar Saturdays" observing program hosted at our showroom and at times hosted at other public locations when supporting regional non-profit astronomy clubs. We feature telescopes brought by friends as well as our own Solarscope DSF-70 filter set, our Lunt 80mm Double-Stack and Lunt 100 Hydrogen Alpha telescopes, DayStar QUANTUM PE Series 0.3 Angstrom and DayStar QUANTUM SE Series 0.6 Angstrom Hydrogen Alpha (12 vdc oven models), DayStar T-Scanner 0.5 Angstrom Hydrogen Alpha (a portable model that requires no power to operate), and DayStar 2.0 Angstrom Single Cavity Calcium K-Line filters among other "white light" filters which we offer. So it is not likely you will raise a question or seek advice that we cannot offer a good reply to, but if you do ask a question that we can not answer then we will most likely know who to ask or what to calculate in order to provide you with the correct answer. 22 Sep 2011 at 12:06:21 GMT (78,871 bytes). 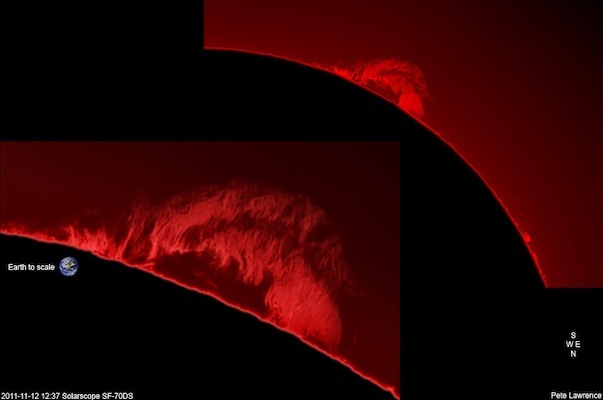 Few experiences can match observing the dynamic force that exists in the chromosphere of our Sun. Solarscope is proud to offer safe, quality, easy-to-use filtering systems specially designed to bring this observing experience to you. Solarscope Hydrogen Alpha filters enable professional and amateur astronomers to witness the hidden dynamics of our sun. These unique sub-Angstrom filter systems allow observers to explore many facets of solar research. 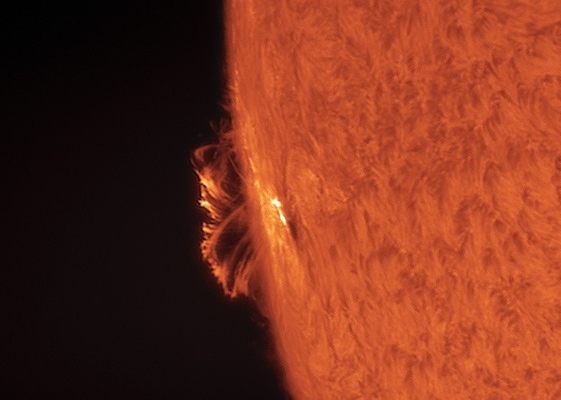 Watching solar flares evolve above the solar disc, prominences swirling against the inky blackness of space, subtle plage and textured filaments sinuously traversing the sun add to the observer's viewing enjoyment. Smaller features such as spicules and intricate mottles change from moment to moment giving the impression of wild fire. We are proud to hear that many consider a Solarscope filter to be the best of its class, and a most powerful observing tool. With a Solarscope filtering system, observational programs are limited only by the desires of the observer.